For Wayne Greenhaw, writing and life are synonymous. From his childhood days in rural Alabama to his days spent south of the border in Mexico, he relates stories of his experiences, finding an Alabama/Mexico connection is some of the most unlikely places. He begins by introducing his readers to his Granddaddy, Hiram Dizzy "Bub" Able, who once told him, "When your hearts in the earth, you know youre home." Ironically, Greenhaw met an old Mexican who told him the same thing years later. And it was then that he knew that his home state deep in the heart of Americas South was somehow related to Mexico. Little did he realize that the common bond was him. To Greenhaw, Alabama, a state most readers know little about, isnt a place, its a "state of mind." His roots run deep in the rich soil and stories of his home. But for Greenhaw, while his home may be Alabama, his heart is forever in Mexico. In this intriguing series of true stories, Greenhaw takes his readers with him as he ventures for the first time across the border at age 18. Written in prose reminiscent of great Southern writers like Truman Capote, Greenhaw shows whats its like to be Southern. The son of a traveling salesman, he grew up with the sounds of the Grand Ole Opry but didnt appreciate the deep, heart-wrenching lyrics until later on in life. As he remembers his childhood, he weaves a tapestry of life in rural Alabama that few readers could never imagine. His cast of characters reads like a Whos Who of the Famous, from Governor George Wallace, a personal friend of his daddy, to William Spratling, an Alabama native son, who single-handedly revolutionized the silver and pottery-making industry of Mexico. His knack for down-home biographical details makes each personage come alive. 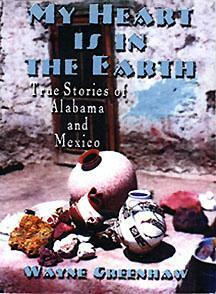 Each character gives Greenhaws tales a special twist that makes life in both Alabama and Mexico easily understood. He recalls the South of the Ku Klux Klan, back roads and good ole boysof green beans, country stores and black eyed peas and cornbread. He introduces his readers to Nub, the ultimate football fan, and to Martin Luther King and the Civil Rights Movement, which he covered for local papers. But Alabama is only half the story. Greenhaw went to study writing in San Miguel Allende a week after graduating high school. On the train, a Mexican General introduced him to his first cerveza, and then to tequila. But that introduction would pale in comparison to some of the characters like Alan Ginzberg, "an overweight poet," he met while studying at the Instituo Allende. Mexico got under Greenhaws skin, just as she does to so many creative people. But he still sees her through Southern eyes.